Gott Heart Art: Penguins Galore! All the challenge titles are pretty self-explanatory when you look at my projects. I had gotten this package of penguin stickers quite some time ago, so I reached in the embellishment box for them and my Penguin Inkadinkado stamp set. This stack of K&Co Let It Snow paper is still a favorite of mine. Smilin' Stef from Jingle Belles inspired me with her trio combo-bag, tag, and card, and Rosemary from Order of the Opus Gluei inspired me with her Side Step card. 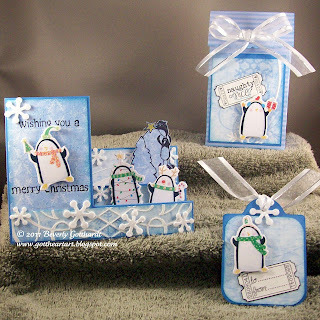 I got to work with great instructions from Splitcoast Stampers, paper, stamps, stickers, and favorite tools to come up with this frosty fun Christmas trio. Supplies: Papers: K&Co Let It Snow Paper Stack, CTMH, SU, Stamps: Inkadinkado-Penguin Pandemonium, Whimsy Stamps-Holiday Ticket Sentiments, Ink: Ranger Archival Ink-Jet Black, SU-Marina Mist, Marina Mist marker, yellow Spica glitter pen, The Paper Studio-glitter snowflake stickers , Me & My Big Ideas-penguin stickers, ribbon-Hobby Lobby. These are all terrific, love the penguins. This all came together so perfectly! I love that you were inspired by the side step card, it is such a fun design. Your penguins look adorable! OG has no problem if you want to combine challenges, we think it is cool how many people can get projects that cover lots of challenges! Thank you for playing along with the Tag Along challenge with us and JB! Love at that fun little bevy of penguins ... such holiday fun ... so glad you joined our jingle belles fun. These are wonderful, they make me feel chilly just looking at them! Thanks for joining us at OG! yeah a whole host of cute penguins all creating penguinmonium - eeeeeeeek - is that as much fun as pandamonium? A proper penguin parade if ever I saw one! Great work Bev. Thank you for sharing with us at Bah! Humbug! Lovely chilly penguin fun Bev! what a great ensemble with the penguins. Thanks for playing with us at Blogger's Challenge! Such a fun take on the challenge - wonderful ensemble! Thanks for playing at with us at the Bloggers Challenge! I love all of your penguins - how cute and clever! Darling card. Love those penguins. Thanks for joining the BC Things With Wings challenge. These all made me smile - so cute.